Presented by the Eastern Produce Council and Produce Business, the New York Produce Show and Conference is a three-day event that offers networking opportunities, a trade show of over 400 companies, educational micro-sessions and much more. NYPS is taking place in New York City from December 10-13, 2018 at the Jacob K. Javits Center. 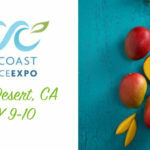 You will find the National Mango Board in attendance and exhibiting during the three-day event, so please be sure to come by for the scoop on all things mango. Click here for more information on the NYPS.